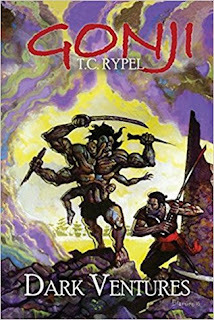 S E Lindberg: Rypel's Gonji Sabatake returns in "Dark Ventures"
Rypel's Gonji Sabatake returns in "Dark Ventures"
Rypel's Gonji Sabatake is back on stage with new tales! The original 1980's Gonji Trilogy is great fun, a mashup of Sword & Sorcery and Godzilla-like monster movies. They were released recently, but there has been no published new Gonji for decades... until now. And this one promises even more! Hear the rallying cry for fans of the popular 1980s heroic-fantasy series. Here are two new tales of GONJI SABATAKE, the itinerant samurai-Viking warrior.. and an excerpt of another forthcoming novel! An ideal entry point for new readers. 3) A generous preview of the coming new forthcoming Gonji novel "Born of Flame and Steel": the audacious origin tale of Gonji’s world.